Make a purrrfect playtime for your feline with the Wooly Wonkz Under The Sea Cat Toy - Clown Fish! 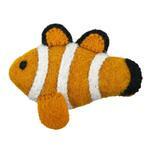 The Wooly Wonkz Under The Sea Cat Toy - Clown Fish is great for your pouncing cat or small dog. Soft and clawable texture cats crave will make playtime fun and safe. Its lovingly handmade wool makes colors and sizes vary slightly, making each toy uniquely special. Made of 100% New Zealand wool. Crinkly film interior will keep play going. Check out other colored fish and Wooly Wonkz Toys. Machine wash cold, delicate cycle. Air dry, do not iron, bleach, or dry clean. * Supervised play only. Discard and replace if damaged as small parts inside can result in injury. BaxterBoo has the finest clothes. I look forward to receiving my orders and dressing my three toy poodles in these outfits. I am ecstatic that I have discovered this company!